Overlooking Shickshinny, Pennsylvania, from the Mocanaqua Loop Trail. Earth Conservancy’s Lower Wyoming Valley Open Space Master Plan (1999) stressed three key components for a successful regional greenspace system: trails, parklands, and conservation areas. The Mocanaqua Loop Trail was one project that resulted from this directive. Located in the historic Wyoming Valley of northeastern Pennsylvania, the original Moc Loop, as it is familiarly known, was actually a system of four individual trails, comprising about 15 miles along the northern reach of Penobscot Mountain: the 2-mile Orange Loop; the 6-mile Brown Loop; the 8-mile Green Loop; and the 7-mile Blue Loop. 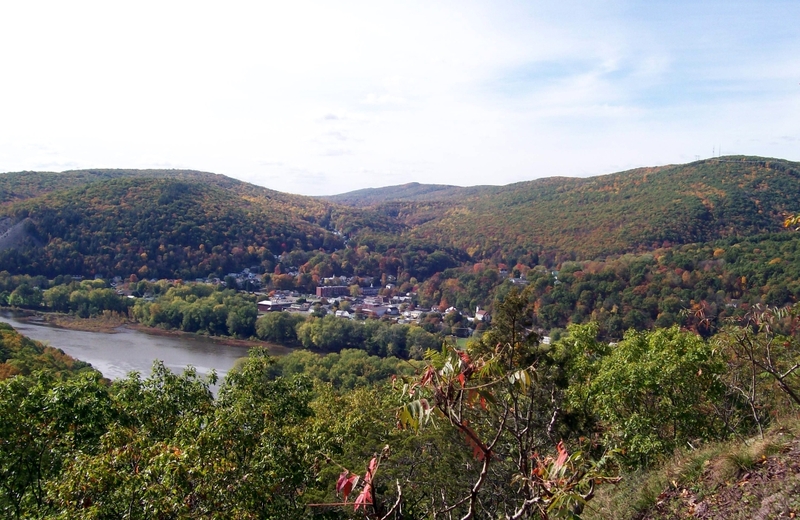 Although the trails vary in difficulty, all take hikers along an unimproved trail traversing the mountainside to its ridgetop, providing scenic overlooks of the Susquehanna River, surrounding mountains, and the small communities dotting the valley’s floor. In addition to the natural features, some areas also hold industrial ruins, harkening back to the former Glen Alden Coal Corporation’s mining of the area. EC began construction on the Mocanaqua Loop in 2001, which included directional and interpretive signage, and facilities at the system’s trailhead, located off Main Street. The Mocanaqua Loop opened on June 7, 2003, on National Trails Day. The project was made possible by funding from the Pennsylvania Department of Conservation and Natural Resources (DCNR), Luzerne County, and the Power Bar Corporation. Over the years, Conyngham Township generously assisted EC with maintenance of the trailhead area.